ArtsEmerson presents Tania El Khoury&apos;s “Gardens Speak” at Emerson Paramount Center. This is a tale of two productions, one big, one small, both of them presented by ArtsEmerson, and both of them, broadly speaking, taking as their subjects the struggle against tyranny. “The State of Siege,’’ which opened Thursday night at the Cutler Majestic Theatre and ran only through Saturday, features a cast of more than a dozen actors swirling through an allegorical 1948 drama by Albert Camus — bolstered by state-of-the-art sound design and video projections — about a town’s loss of freedom when a mysterious plague arrives. Tania El Khoury’s “Gardens Speak,’’ at the Paramount Center through Nov. 19, is an interactive sound installation that unfolds on a patch of soil in complete darkness and features no cast at all — at least none that’s visible — while sketching portraits of 10 Syrians killed during the Assad regime’s crackdown on the population and buried in gardens across the nation. It is the small-scale, wrenchingly intimate “Gardens Speak’’ that lodges itself hauntingly in the memory, while “The State of Siege’’ is diluted by grandiloquent abstractions. As The Plague (Serge Maggiani) crushes liberty in the name of “silence, order, and absolute justice,’’ ArtsEmerson clearly wants us to keep Donald Trump’s disturbing authoritarian predilections in mind. But not even Trumpian parallels can endow “Siege’’ with sufficient urgency. Much of the fault, it pains me to say, lies with Camus, a longtime personal hero. The production by the Paris-based Theatre de la Ville is inventively staged by director Emmanuel Demarcy-Mota and features a fiercely committed cast that includes Valerie Dashwood as The Secretary, a kind of henchwoman to The Plague, as adept at Orwellian doublespeak as he is; Philippe Demarle as a truth-telling drunkard named Nada; and Matthieu Dessertine and Hannah Levin Seiderman as young lovers. Only 10 audience members are allowed in at a time to “Gardens Speak.’’ Seated onstage in a darkened theater, we were asked to remove our shoes and socks and to don white plastic coats. After being handed a piece of paper with a name on it, we walked to an adjacent space, where 10 gravestones were arrayed in a long, rectangular garden. 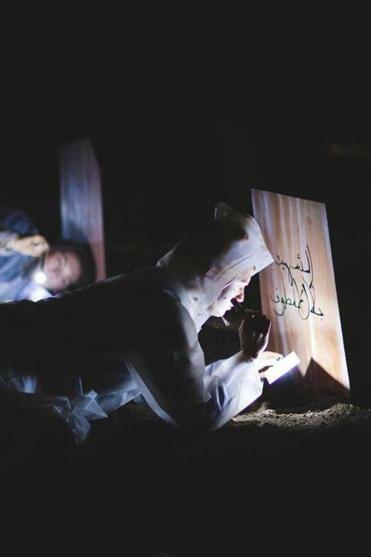 I knelt before the gravestone marked “the martyr Ayat,’’ memorializing a young woman named Ayat al-Qassab who, according to El Khoury, was buried in the garden of a relative’s home in the Karm al-Zaytoun district of Homs, Syria. Following instructions, I dug through the earth until a soft voice began to issue from the ground, then lay down in the darkness to listen, while the other nine spectators did the same in front of other gravestones. Speaking in the first-person, as Ayat, the voice told of her excruciatingly short life: her dreams of being a teacher, her marriage at age 15, and her pride in being part of the opposition to Assad, whom she held responsible for the wholesale killings of women and children who only “wanted to live in a country that loves them as much as they love it.’’ Finally, the voice told of Ayat’s own death after a shell landed in the middle of her house. I was left with a feeling of loss for someone I never knew — and reminded how much power there can be when one human voice, unstilled, speaks the truth to one listener. Don Aucoin can be reached at aucoin@globe.com. Follow him on Twitter @GlobeAucoin.